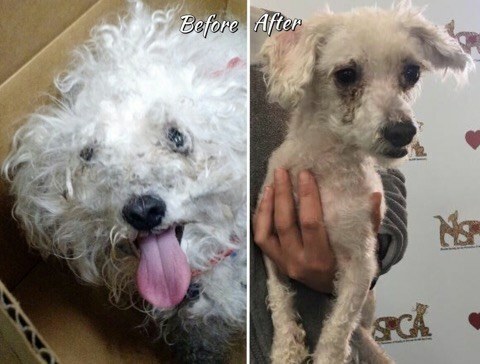 From Abandoned To Adored This Little Guy Needs A Forever Home! Hello world! My name is Shaba. You probably don’t recognize me now because when I first came to the Nevada SPCA it was with an overgrown and matted coat. I was found in a box dropped out of a moving car. Needless to say it has been quite a journey from then to now. The great staff here did not hesitate to scoop me up with open arms and immediately get me checked out and groomed. I am still pretty sensitive around my face area but I feel so much better now. I am friendly with other doggies but it takes me a little time to open up and trust new people which I’m sure no one can blame me, considering my past. I have gotten comfortable with the staff here and have opened up immensely! And come to find out, I LOVE squeeky toys! AND being held by my trusted friends here… in all honesty, I really am a big love bug in a little body! I am so thankful to the Nevada SPCA for not turning a blind eye and instead, giving me a chance at a better life… if you give me a chance and show me TLC I promise to love you for all my life! Please bring any doggies you currently have to meet me, And it may be best that if there are any children in the home they be much older, mature and have a gentle patient way about them. Be a part of my amazing story and adopt me today!